Below constitutes what might be termed my "heavy notes" for the sermon this past Sunday. It is almost a sermon in its own right. I often write sermons in this way. It allows my to clarify thoughts. But, each part of the sermon is also somewhat self-contained in parts. This allows me flexibility to remove a section, change the order of some things, and/or to add to the sermon. For the actual sermon I invite you to take about 15 minutes and listen to the audio which should be posted to the Listen to Sermons page of the website. Nelson Mandela once said, “People must learn to hate.” I disagree. I believe hate is our natural default. Nobody has to teach a child to be selfish, to scream and throw temper tantrums because somebody else is playing with their toy. Nobody needs to teach a child to hit or bite others. Children can be passionately empathetic, but they are also extremely selfish. Instead, the things we have to teach children are things like not hitting just because you are mad. We have to teach them that “sharing is caring.” We have to teach them that we cannot just get rid of their sibling just because, but that of all people in the world they need to love their siblings. We teach them manners. We teach them rules and laws. And, we explain that it is bad and evil to break rules and laws. We have to teach them that just because somebody is different from us, it does not make that person any less of a person. Nobody needs to be taught how to hate. Instead, we constantly find ourselves teaching how to love. The Woman of Canaan By Michael Angelo Immenraet, between 1673-1678. Public Domain. In our Gospel Lesson a Canaanite woman asks for Jesus to have mercy on her by saving her daughter for a demon. Jesus rebuffs her and calls her a “dog”. “Dog” was used as a slang term by Jews back then. It was a term meant to lessen the humanity of people who were not Jewish. There is an equivalent in our society, but I dare not say it. Is Jesus being racist? Is not racism antithetical to the Gospel? Paul tells us that there are no racial distinctions in Christ. God sends Jonah against Jonah’s will to preach the gospel in Babylon. Jonah does not want to go because he wants God to destroy those he considers less than human. God reminds Jonah that nobody is outside the reach of His forgiveness. That those Jonah hates, God created They are equal to Jonah and God loves them just as much. So, what in the world is Jesus doing? How can he say that and still be sinless? Biographies in the ancient world did not have to follow chronological timelines as they have to do today. Instead, if the author felt something was relevant to a certain theme but took place at a later time it could (and would) be included. In other words, stories that might be years apart would be told alongside each other with no indication of a timeline difference. Jesus is not being racist. Rather, he is giving a dramatic object lesson. In Matthew 14 we got a laser focus on Jesus. That He is the only hope for salvation. That He came to die for us because of the love God has for us. In chapter 15, Matthew starts to expand on that. Pharisees and scribes come all the way from Jerusalem to question and investigate Jesus. “Why do your followers break our traditions?” they ask. These are the people that know God’s law forward and backwards. Scribes were highly trained. They trained for years before they would be allowed to make copies of the Scriptures. The Pharisees knew the Scriptures and “kept” God’s law. They were the most favored group of people in the eyes of the people. They were the ones God truly loved. And Jesus accuses them of breaking God’s law with their traditions. That their faith is one of lips but not of belief. In other words, just because they were Pharisees, just because they were Jewish, did not mean that they were favored by others. Actually, they stood guiltier than others because they were “teaching as doctrines [of God] the commandments of men.” They were perverting God’s word. It is not our outward form that defiles a person, Jesus taught. Instead, it is what is already on the inside. It is our sinful nature and our giving in to our sinful nature that makes us guilty in the eyes of God. Our words and actions are a reflection of our thoughts and feelings, these are what make us unclean. Then Matthew tells us the story of the Canaanite woman. She cries to Jesus for mercy. He ignores her. Nevertheless, she persisted. She persisted until the disciples got annoyed. “Send her away,” they complain. Why? Because she was merely a dog. Not worthy of an Israelite’s compassion. His response is a reflection of the sinners around him, including the disciples. It exposes their hearts, and in their hearts, was nothing but contempt for somebody who was not like them. “I was sent only to the lost sheep of the house of Israel.” In other words, because you are a dog you are not worthy of God’s mercy. But, she persisted. “Lord, help me.” And he answered, “It is not right to take the children’s bread and throw it to the dogs.” Again, reflecting the sinful thoughts around him. And, finally in this great drama the other shoe drops for the disciples to realize the hardness of their hearts. How they were just as guilty as the Pharisees and scribes before. How their racism is antithetical to God’s mercy. “Yes, Lord, yet even the dogs eat the crumbs that fall from their masters’ table.” You see, even dogs desire God’s grace. “Then Jesus answered her, ‘O woman, great is your faith! Be it done for you as you desire.’ And her daughter was healed instantly.” They are not dogs but people Christ came for. They are people Christ suffered and died for. 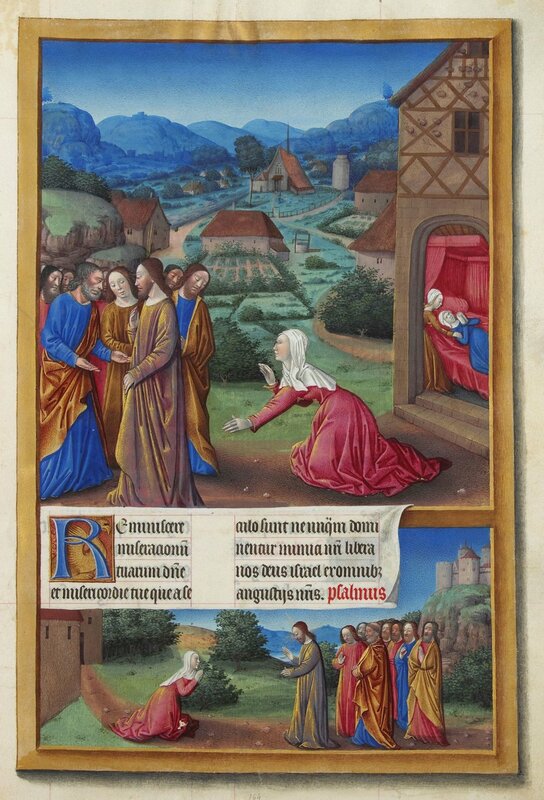 The Canaanite Woman, Les Très Riches Heures du duc de Berry, 16th century. Public Domain. You have to go beyond our reading a bit to see Matthew finally hit the reader over the head with the message. Mt. 15:31 so that the crowd wondered, when they saw the mute speaking, the crippled healthy, the lame walking, and the blind seeing. And they glorified the God of Israel. Racism has not place in the church or in a decent society. Racism, like all sin, has no place in the heart of a Christian. Christians must be against racism because our God and Lord gives us no other position. Matthew makes this a recurring theme in his gospel. Starting with chapter one in giving the genealogy of Jesus he lists, Rahab (a prostitute from Jericho) and Ruth (a Moabite). Instead, Christians and the church are called to confront racism as we are called to confront all sin. We are called first to confront it in our own hearts and minds. Secondly, we are called to teach God’s love of all people to our children. Thirdly, we are called to confront it in another Christian. Fourth, we confront it in our society. We do this as we do any other sin. Once, we knew only how to hate. But, through Christ we have been shown a better way. Once, we knew not love. Now, we know a love of overabundance. Once, we were enemies of God. Now, we are His children. So, as His children I pray. I pray that we always have the courage to confront evil, no matter what name it bears. I pray that we do not tolerate the traditions of men for the sake of the Gospel. I pray that every day we become more saint than sinner. I pray that we make the love of God known to all. May God always guide us by His Pure and Holy Spirit to do so. Amen. Newer PostWhy Lutherans Are Not T.U.L.I.P.